I can now say I had a brush with greatness, sort of. One of the watches that no man should ever own, and I want to own is the Rolex Daytona Cosmograph, and more specifically, the Paul Newman model, and even more specifically reference 6265 Paul Newman Rolex Daytona Cosmograph Manual Wind. Just in case any of you want to run out and buy me a present or anything! In order to understand the history of the Rolex Daytona, you must be introduced to Sir Malcolm Campbell, who broke 5 land speed records between 1924 and 1935, and was considered to epitomize the Rolex lifestyle. Although a Rolex model was named after him, he was actually considered to be the brand ambassador for Rolex for many years. After Sir Malcolm Campbell left Daytona, due to poor track conditions, William France, Sr. took over the Daytona track and brought stock car racing to the Daytona and revitalized the track and the Rolex Zephyr was the watch that most racers wore, until the Rolex Chronograph, which was the grandfather to the Rolex Daytona was born in 1955. The other night I was out to dinner with my beautiful wife and I needed to take a trip to the men’s room. Being that I am in the watch and jewelry business, I am always looking at what other people have on their wrists, ears, fingers and necks. I can’t help it. I notice, and truth be told, it’s not a bad thing, because this habit has been a big plus in my marriage. I notice. Anyway, as I was standing there doing my business, when this older gentleman walked in and stood next to me doing his business. I wasn’t comparing the goods, but I did notice his watch, because his arm was resting on the edge of the porcelain next to our adjoining urinals. He was wearing IT. Hey Man, love your watch! Thanks, he replied as he glanced down at his vintage timepiece. This old thing? I got it years ago when I was in the military at the PX when I was stationed in Germany. I’ve had it that long. Why? I think I might have been drooling. I would love to buy that watch from you. Would you be willing to sell it? Why would you want to buy this old watch? This guy didn’t even know what he had. I would pay you $10,000 for that watch. What do you think? It was at this point that the guy might have sprayed across the tiles in front of him in shock. Good thing we had that divider in between us. I wanted that watch. I explained that I was a diamond and watch buyer and handed him my card and explained that I was legitimate. But, in the end, this watch for him wasn’t valuable because it was a Paul Newman Rolex Daytona, it was valuable because it made it through the war and was his badge of courage that he too made it through the war and had lived this many years and was still here and enjoying life. The early models of the Rolex Daytona were all manual wind. These watches you have to wind yourself, unlike the models today that when you move, they wind themselves. These are the watches that get my motor running. 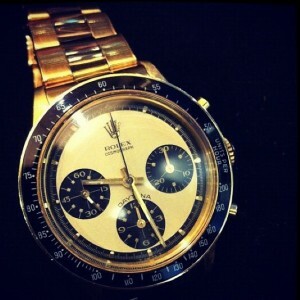 Like this guys Paul Newman Rolex Daytona Cosmograph. These are the watches that I want to own, buy and sell. These are the watches I want to start to build my business around. These are the watches that I want you to start to bring to me. If you have any of these watches, call me… (832) 277-5725, email me Sergio@jonathansdiamondbuyer.com or contact me.